The Hilton Hotel will be built on the site where a museum in the Bohdan Khmelnytsky Park of Lviv that was closed, Lviv Mayor Andriy Sadovy said at a meeting of the executive committee of Lviv City Council. 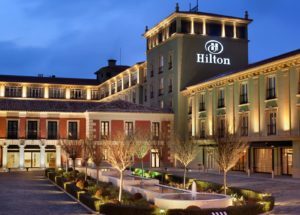 “We have made a decision: in Lviv, they want to build a hotel, it seems, Hilton. There should be half of the building – a classic hotel, half of the building – an apartment hotel. This should be a building of high architectural level – a work of art,” Sadovy said. According to him, the developer agreed to finance the reconstruction of the Bohdan Khmelnytsky Park. According to the text of the decision of September 20, 2018, the Lviv City Council approved the sale of a land parcel of 1.06 hectares located at 1, Lyzhvyarska Street in Lviv to Aparthotel LLC for UAH 18.52 million. According to town planning conditions, the height of the building should not exceed 34 m. The building area is approximately 1,600 square meters. The total area of apartments is 8,300 square meters, or 157 apartments. The infrastructure of the facility will also include an underground parking area of 1,400 square meters. 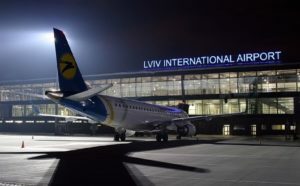 Lviv International Airport in March 2019 increased passenger traffic by 59.2% compared to March 2018, to 133,900 people, according to the official page of the airport on Facebook. At the same time, the number of serviced flights last month increased by 31.3%, to 1,292. Some 119,100 passengers were transported on international flights (a growth by 70.4%), and 14,800 people on domestic flights (an increase by 4.2%). In the first quarter of 2019, some 369,400 passengers (328,800 on international and 40,600 on domestic flights) travelled through the airport, which is 53.5% more than in the same period of 2018. The number of flights in January-March reached 3,606 (3,053 international and 553 domestic), which is 26.7% more than in January-March last year. As reported, in 2018 passenger traffic rose by 48% compared with 2017, to 1.598 million people. 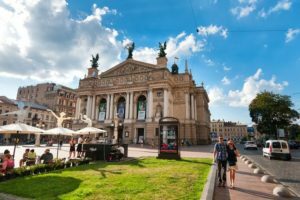 Lviv City Council has set the rates of tourism fee at 0.2% to 0.5% of the minimum wage for Ukrainian and foreign tourists, depending on the cost of their accommodation. The rates will take effect on April 1, 2019. According to the report on the website of Lviv City Council, the smallest rate of tourism fee is 0.2% of the minimum wage (UAH 8.4) and will be applied if payment for accommodation does not exceed UAH 350 per day. If the cost of living is UAH 350-750 per day, the tourism fee will be 0.3% (UAH 12.5), UAH 750-1,200 per day some 0.4% of the minimum wage (UAH 16.7). The rate for tourists who pay more than UAH 1,200/day for accommodation will be 0.5% of the minimum wage (UAH 20.86). At the same time, Lviv City Council set equal tourism fee rates for Ukrainian and foreign tourists, the report says. At the same time, it is noted that the rate of tourism fee for tourists living in the private sector is calculated on the basis of the cost of such property per day, regardless of the number of residents. 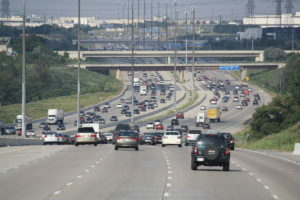 The State Agency of Automobile Roads of Ukraine (Ukravtodor) has started designing the reconstruction of highway M-06 on the Lviv-Rivne section, taking into account the expansion from two to four lanes, as well as the construction of detours of settlements, the agency has said. “After the completion of renovation, the saving of travel time from Lviv to Rivne without breaking traffic rules will almost halve to 1.5 hours,” Ukravtodor said. The agency noted that a significant part of exported cargo is transported to the European Union member countries by this road, and therefore its reconstruction, in the opinion of Ukravtodor, will be an impetus for the economic development of the region, will help facilitate investment and create new jobs. In addition, the new quality of the road will improve the level of road safety and the environmental situation in cities. 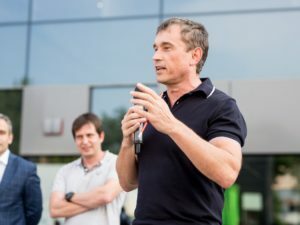 The UFuture Investment Group of businessman Vasyl Khmelnytsky, which portfolio includes UNIT.City innovation park in Kyiv, plans to launch the first phase of LvivTech.City at the end of 2019, the founder of UFuture Investment Group Vasyl Khmelnytsky has said in a blitz interview with Interfax-Ukraine. “We are planning to open LvivTech.City Innovation Park at the end of 2019… We can say that the first Lviv campus will combine office and commercial sections (cafes and restaurants). The office space will be 9,500 square meters, commercial – 3,000 square meters. It will also be built according to the standards of “green” construction,” Khmelnytsky said. According to him, the company has not yet attracted partners and loan financing for this project and it is building the space at its own expense. “The park has residents, but we do not sign the contracts until we reach the final stage of construction,” the businessman said. In addition, the company intends to open an educational space in Kharkiv this year. “This year we will launch an institute and a co-working space in Kharkiv. There is already a modern building with an area of 12,000 square meters, in which they will occupy about a quarter… This is the initial stage. The park will expand with the growth of the market,” Khmelnytsky said. As reported, LvivTech.City will be located on a land parcel of 1.77 ha on the territory of the industrial zone of former Lvivprylad plant. The project would allow creating new jobs and open the territory of the closed enterprise for society. It is planned that the gross area of the office sector of the LvivTech.City will be over 40,000 square meters. The park would have parking zones, green zone and territories for recreation. In addition, the project will be implemented meeting the LEED green building standards. The completion of the first stage of the LvivTech.City earlier was scheduled for H2 2018. UFuture and Kharkiv Polytechnic Institute will build and open in Kharkiv the Innovations Campus educational space worth more than UAH 60 million. Earlier it was planned that the campus will start operating at the end of 2018. The training will be based on an innovative educational program, which was developed by UNIT Factory specialists in cooperation with Kharkiv Polytechnic Institute and other Ukrainian higher educational establishments. In addition, the Small and Medium Entrepreneurship School will continue its work at the campus, whereas modern co-working will open the possibility for start-ups and creative young professionals to get jobs, qualified professional business support, security, access to knowledge. The organizers also plan to attract investments from the state, enterprises and local business to finance this social and educational project. UFuture Investment Group, headquartered in Brussels, was established in autumn 2017 and united the business projects of Khmelnytsky. The group includes the Ukrainian development company UDP, whose specialization is the implementation of large infrastructure projects. In addition, the conglomerate united businesses in such areas as UDP Renewables, the Bila Tserkva industrial park, the innovation parks UNIT.City, and LvivTech.City.